Okay, after Star Trek – The Motion Picture, I believe that hopes for the second Trek movie, The Wrath of Khan were a little muted: who wants to set themselves up for disappointment. Well, little did we (Star Trek fans), know that we were in for a treat. 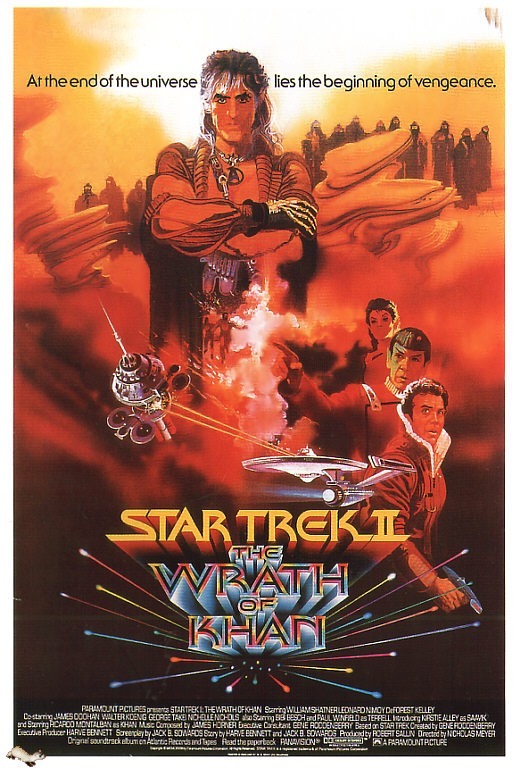 Wrath of Khan, the second movie in the Star Trek series of movies, revisits an episode from the original series, “Space Seed” where the enterprise encounters an ancient ship containing the cryogenically frozen bodies of a group of genetically enhanced “Supermen,” banished from Earth in the late 1990s for their crimes against humanity. Doctor McCoy revives the survivors. The e leader of the group of exiled people, Khan Noonien Singh, is a most charming man, and soon attempts to capture Kirk’s ship. Failing, Khan and his crew are exiled to a garden Planet, Ceti Alpha V.
In Wrath of Khan, Khan is encountered accidentally when original series character, Chekov (played by Walter Koenig) beams down with his current captain, Clark Terrell (Paul Winfield) of the USS Reliant, to a planet they believe is Ceti Alpha 6, to investigate some life readings on a planet they believed to be uninhabited. The planet itself was being investigated as a possible test bed for the Genesis device – a device that can transform a dead world into a thriving, living world in almost no time. Shortly after arriving on the planet, Chekov discovers that they are on the scene of what is left of the Botany Bay – the ship,minus the drive components, that was used to exile Khan and his crew years ago. Soon they encounter Khan, who explains that they are actually on Ceti Alpha V, and that Ceti Alpha VI exploded shortly after their being exiled, and that the planet was forced from it’s orbit and had been changed from a garden to the inhospitable wreck that it is now. Khan, finding out that Kirk is still alive, has decided to exact revenge on him for the marooning (and subsequent deaths of many of his original crew), by taking the Reliant and fooling him into a trap. There is some really good space ship to space ship combat. Actually, some of best space combat that I’ve ever seen. You also get to learn a little bit more about Captain Kirk’s life… I won’t tell you anything about that in case there’s a chance you haven’t seen this movie yet. Oh My Gawd…. This movie has it all for a Sci-Fi fan: the acting is better than almost any Trek story, and Khan, played by the late, great Ricardo Montalbán, revising his role from the Original series episode is deliciously over the top. The humour that was missing from the first film is here, and there are some pretty emotional scenes, too. The movie is pretty deep for a Sci-Fi film. Another thing that stands out to me at least, is the orchestral score during the space battles- really awesome stuff. This movie is just good. This is the Star Trek movie I play for friends who don’t understand why I like Star Trek. This entry was posted on September 26, 2013 by catfishman. It was filed under 80's, abduction, b movies, brains, Canadian, Captain Kirk, crazy, crime, entertaining, entertainment, epic, evil, family, film, fun, good, great, gritty, hate, humanity, injustice, Khan, Khan', movies, murder, music, original, paranoid, powerful, prison, revenge, reviews, science, Shatner, Star Trek, theatre, trailers, vengence, war, watch, Western and was tagged with 80s, abduction, B Movies, brains, Canadian, Captain Kirk, crazy, crime, entertaining, entertainment, epic, evil, family, film, fun, good, great, gritty, hate, humanity, injustice, Khan, Khan', movies, murder, music, original, paranoid, powerful, prison, revenge, reviews, science, Shatner, Star Trek, theatre, trailers, vengence, war, watch, western.